For as long as I can recall, this picture, painted by my father in his teen years, hung in the bedrooms of my youth; now, it graces a wall in my den. In my dimmest recollections, I can picture it on the wall hanging over my bed when I was five and we were living in a rented flat in West Chicago. It came to California with us in 1948 when our young family moved here, and it hung in my room when I went off to college in 1958. For many years now, it has graced a wall in my den. It is a precious family heirloom, closely related to yet another which was “lost” until fifty years ago. 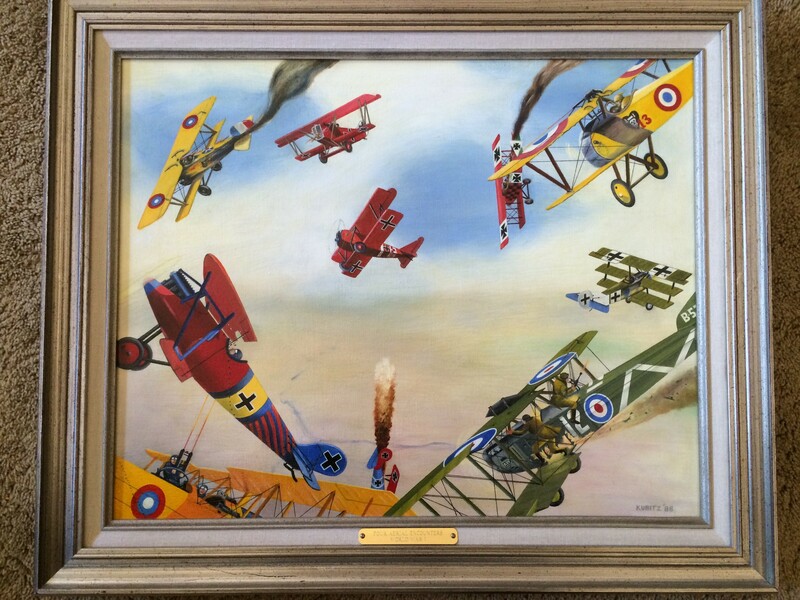 When I was barely in my teens, my dad told me that the painting’s depictions of aerial battle came from so-called aviation “pulp-magazines” that he had collected as a boy – inexpensive, popular publications that featured stories and illustrations of early warfare high above the ground. 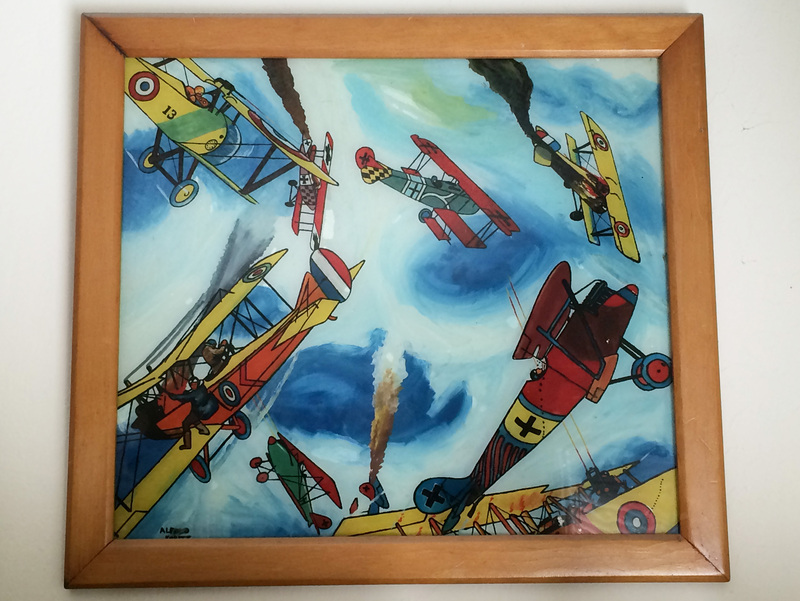 In the case of the painting shown here, Dad painted a montage of several such illustrations directly on the back of a sheet of glass…using house paints! There was no money for artist’s oil-paints or canvases in his boyhood household! Despite this unusual approach to painting, the colors remain brilliant even though the work is over eighty years old. In my youth, I often reflected upon the great thrill it would be to have the original paper illustrations which so captivated my dad as a teenager and which he chose to paint in my picture. Alas, they were all long gone…or were they? When my maternal grandmother died in Chicago in the early nineteen-sixties, my parents and my mother’s younger brother (my Uncle Ed) went back to make necessary arrangements for the burial and the sale of the little brick house located in a west-suburb of Chicago – the house that my grandparents purchased new in 1938. There were old trunks up in the attic of the house. As was explained to me at the time, some of these contained memories which were too painful for my mother and uncle. My grandmother was a life-long alcoholic whose behavior made the lives of my grandfather, mother, and uncle very difficult. Most of the family memorabilia in those trunks was discarded or destroyed. Almost none of it came back to California. While cleaning out the attic of that little brick house, my father and uncle unexpectedly came across something very special, one of the few things that they brought back with them to California. 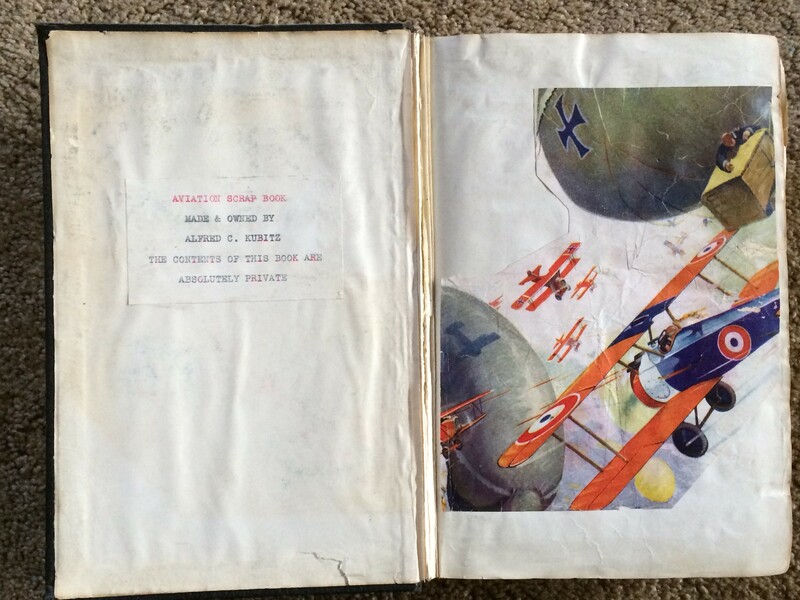 It was an aviation scrapbook assembled by my father in the early nineteen-thirties. Dad had given it to the younger brother (my uncle) of his soon-to-be wife shortly before their marriage in 1939. When Uncle Ed fled Chicago to join us in California around 1953, the little book stayed behind, tucked away amid all the rest of the “stuff” in the attic. 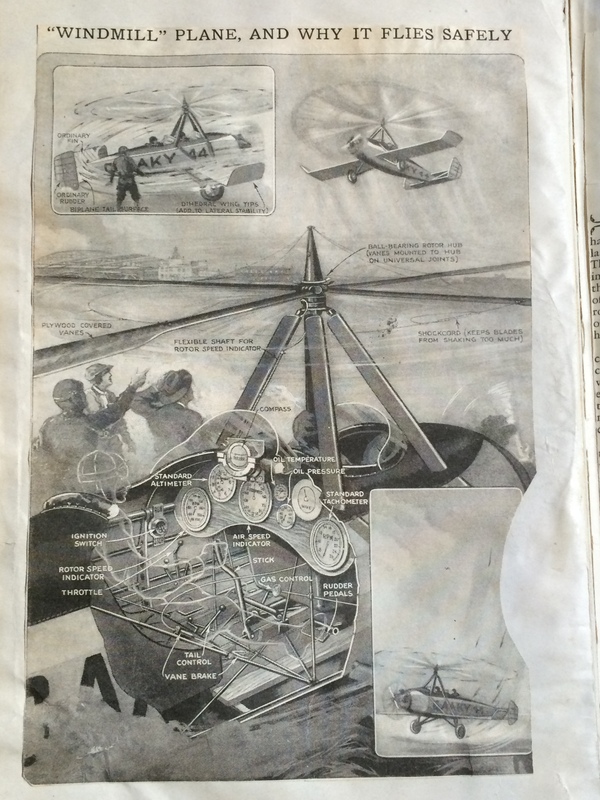 The scrapbook contains articles, photos, and illustrations documenting key events, milestones, and people in early aviation. In addition, and most exciting of all to me, the book contained the original pulp-magazine illustrations, cut from their original pages, of the key scenes in Dad’s painting! It was a great thrill to actually hold the paper “models” for the familiar depictions in that painting that I knew so well. Lindbergh, Richard Byrd, Lieut. Jimmy Doolittle…and other famous fliers! 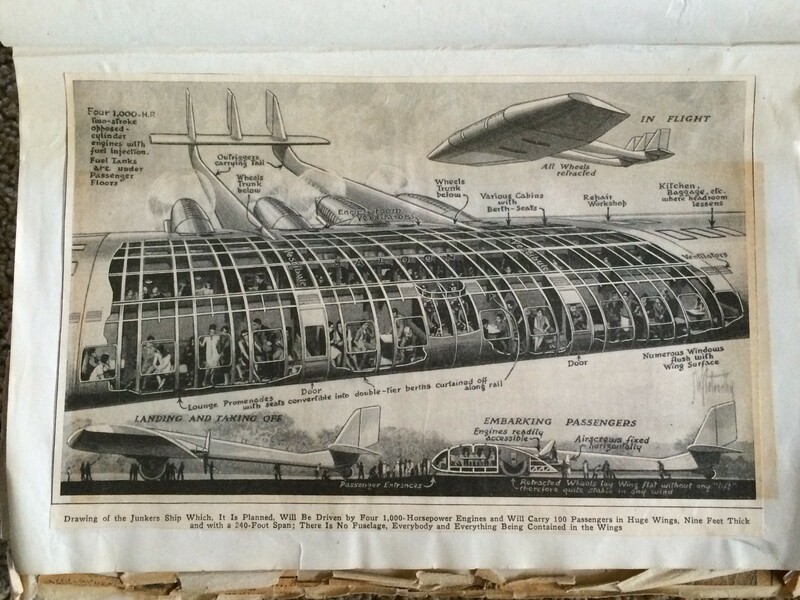 The many pages contain scores of news-clippings, magazine articles, and illustrations – virtually all highlighting significant aviation advances and events of the late nineteen-twenties and early thirties. 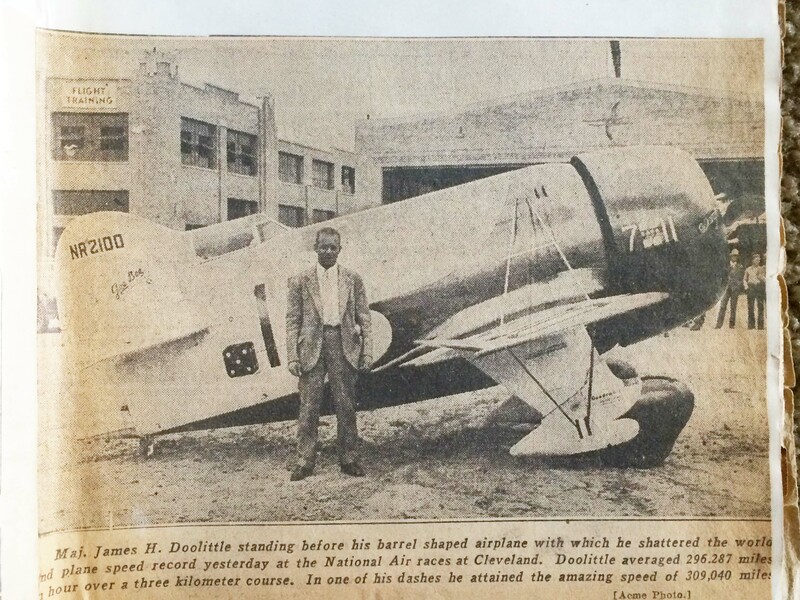 Here is an actual news clipping from the day after Jimmy Doolittle set a new average air-speed record of 296 miles per hour around the closed course of the then-hugely popular National Air Races. His plane was the infamous (often deadly) Gee Bee racer which looked and flew like a bumble-bee but delivered high speeds and national speed records. Another famous aircraft which captured the public’s fancy in the early thirties were the huge dirigibles. Pictured here is the U.S. Navy’s Akron as it made its maiden flight in 1931 over Akron, Ohio. As smaller, safer, and more manageable “blimps” were developed, the huge, rigid-frame dirigibles lost favor and disappeared forever. Several highly publicized crashes hastened their demise. Not many miles from here, Moffett Field still has a huge hangar structure which housed the Akron’s sister ship, the Macon. Both of these huge airships met disastrous ends. 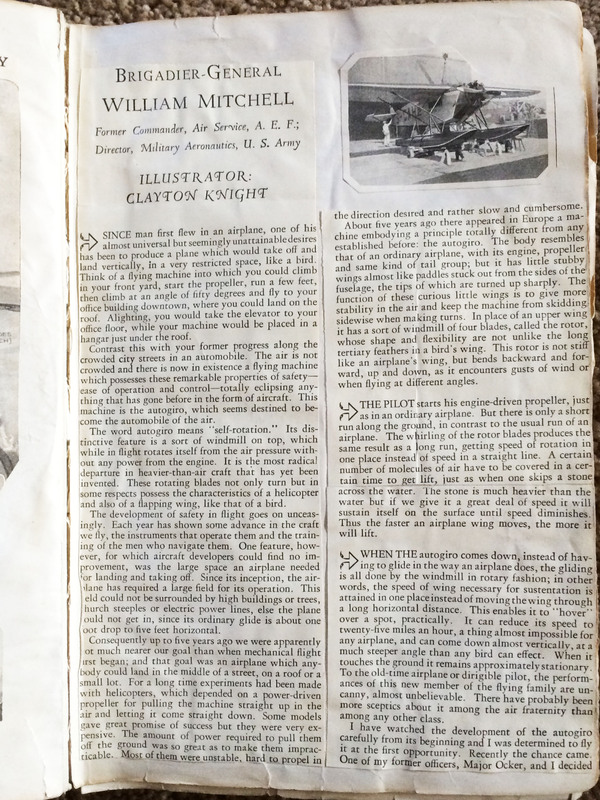 Famed Brigadier General “Billy” Mitchell, an early advocate of air-power who demonstrated the ability of the Army Air Force to sink battleships with aerial bombing, here weighs-in on the operation of the auto-gyro aircraft. 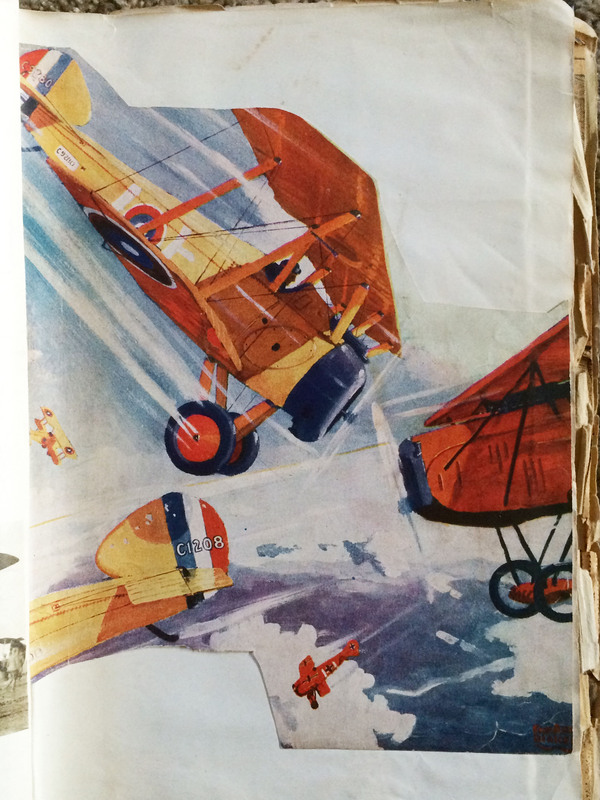 This little scrapbook was clearly assembled by someone who closely followed the rapid developments in aviation which occurred just after the depression – and that person was my father in his teen-years. While he loved anything and everything having to do with airplanes, his careful choice of relevant articles demonstrates far more than a fanciful love of aviation; it belies an early interest in the larger picture: aviation technology and the prospects of aviation to become a major force in the military and in society. My dad was thrilled by the romantic aspects of aviation as epitomized by barnstorming pilots who would come to town and offer short rides in an open-cockpit Curtiss Jenny for a quarter – many boys were. But he would also want to know about the Jenny itself – how it operated and how to fly it – truly the outlook of a future engineer…which he became. For more on my dad and his love of flying, see the following posts of mine in the blog archives: Family Funnies / Great Laughs!, June 9, 2013; The Work Ethic and the Dignity of Excellence, September 15, 2013. I would like to have illustrated, in this post, the specific pulp-magazine cut-outs my dad pictured in the on-glass painting which appears at the beginning of this post, but these are currently stored in our safe-deposit box and not available in time for this post to go online. I have instead used some of the many other representative images which are pasted in his scrapbook. 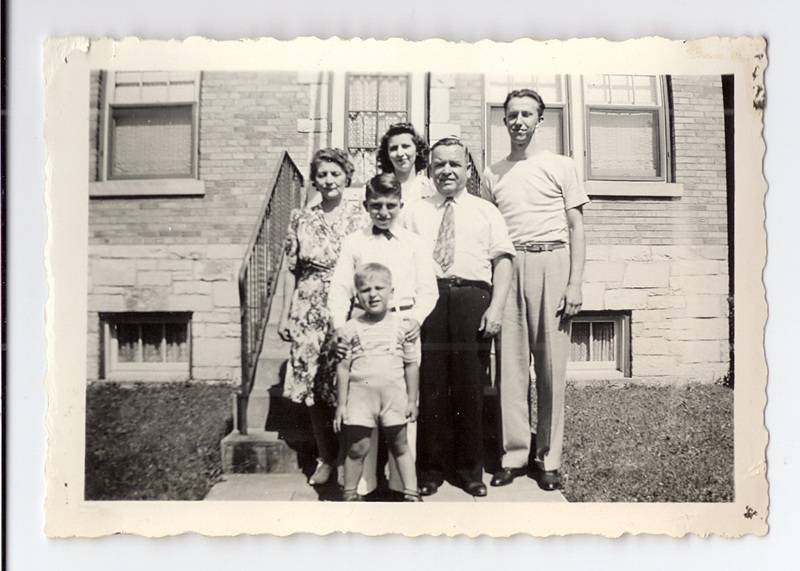 This 1943 photo shows me with my Uncle Ed, my mother, father, and grandparents in front of the little brick house in West Chicago in whose attic the aviation scrapbook, presumed lost, was discovered some twenty years later. My dad was a remarkable individual in so many ways; the same could be said of my mother in the more arts-oriented venues. Despite having a superb engineering aptitude, he also had a talent for painting and illustration, a pastime he pursued early in life and even more vigorously later on. Despite acquiring a taste for scenic views and still-life subjects, he never lost his love for the more graphic arts – especially when it came to aviation. In 1988, he went back to the theme portrayed in his early, on-glass picture, and painted in oils on canvas, a more detailed version of his original work. It hangs on our hallway wall, just outside my den. Standing in my doorway, I can simultaneously admire them both. 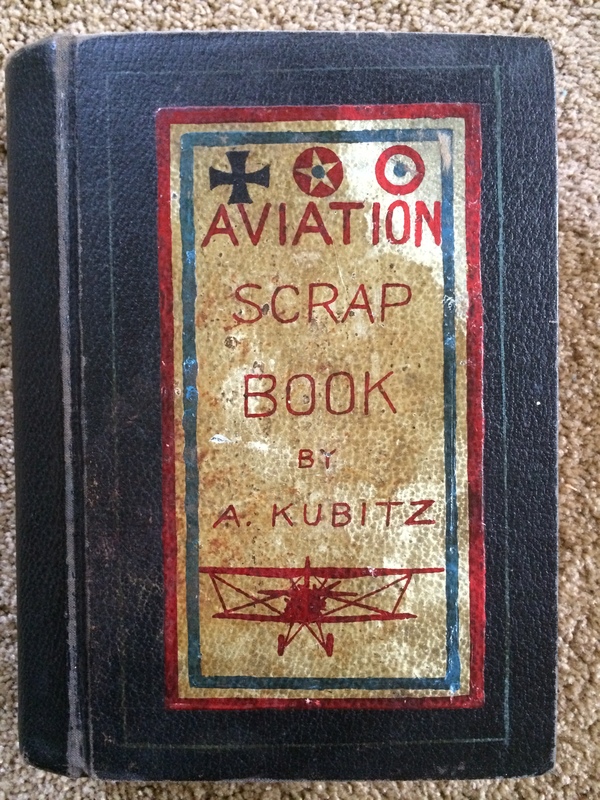 As for my prized aviation scrapbook, I suppose I should someday contact the Smithsonian or some other society about its historical significance to aviation and the possibility of restoring the deteriorating binding. I probably will do that. This entry was posted in General History, Technology and tagged Akron, attic, aviation, aviation history, aviation scrapbook, Doolittle, Gee Bee, Lindbergh, Macon, National Air Races, Smithsonian, speed record, treasure by Alan. Bookmark the permalink.